One of my favorite childhood treats is a root beer float. I attended a private school for 8 years, it wasn't fancy, to say the least, so we didn't always have the best toys, sports equipment, books, and so on. Needless to say, we had to walk to another school for P.E., we were that school. So every year it was the same on the last day of school. A picnic at the park and root beer floats. And I loved it. I loved the consistency that it happened every year, at the same park, with the same kids that I had known since kindergarten. Oh, those root beer floats were everything. Nowadays I still love the classic float. But even more, I like to make my own soda, pack the glass full of ice cream. Because I'm the adult now, I can do that. And sit outside with my kids as gulp down this twist of a classic treat. There are so many great options for this float. 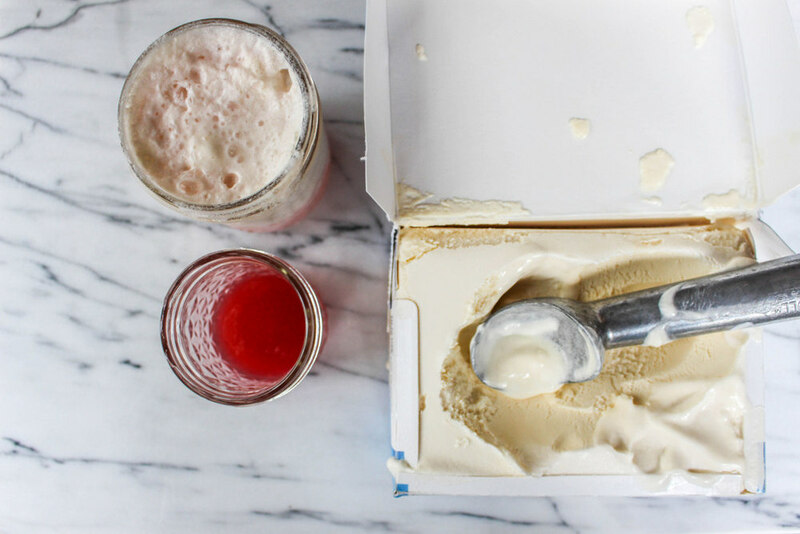 Just last week we made a Watermelon Soda Float. It was, crazy good. Making your own soda is easy. Take your basic simple syrup recipe and add some fruit or any sort of flavor. One of my favorites is, Lavender Honey Syrup turned into the most amazing float there ever was. 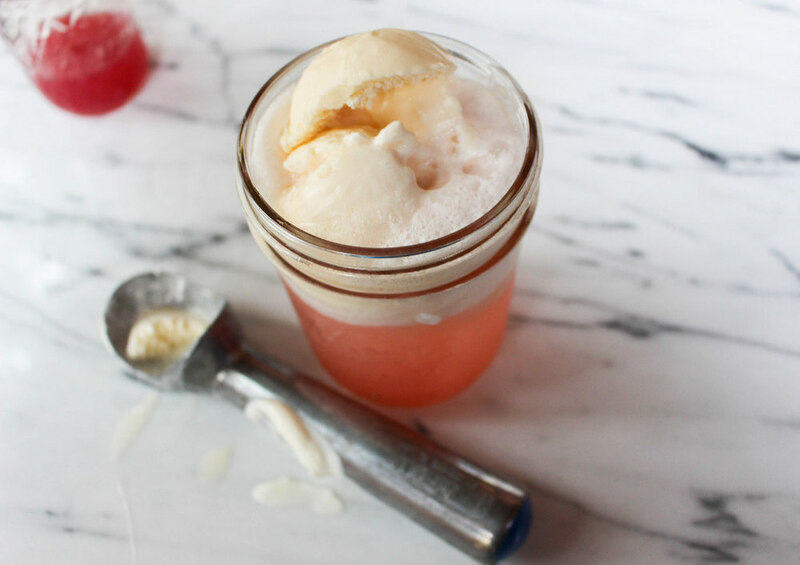 But this rhubarb soda float, is just about perfect. Tart. Sweet. Creamy. It just doesn't get any better. Combine all ingredients in a medium saucepan and bring to a boil. Once the mixture is boiling, reduce to low and simmer for 20 minutes, stirring occasionally. Place a fine mesh strainer over a heat proof bowl, and begin to ladle the rhubarb into the strainer. Press gently on the rhubarb with a spatula or spoon to push the juices through. Pour the syrup into a jar to store. I like to keep the meaty rhubarb that did not become syrup and use in muffins, mixed into yogurt and granola or spread on top of toast. Note, this simple syrup can be used for Rhubarb Soda Floats, simply rhubarb soda, or even better, rhubarb margaritas. Take 2 tall glasses and divide club soda into each glass. Mix in 1/4 cup rhubarb simple syrup into each glass and 1 teaspoon of honey per glass. Mix and taste. At this point you can add the remaining 1/4 cup rhubarb simple syrup, more honey or more soda. It just depends on how sweet you like it. Top with vanilla ice cream and serve.